Desktop Standalone Universal USB Sync and Intelligent Charge for up to 16 iPads, tablet PC’s, mobile phones, digital cameras, MP3 players and all other USB chargeable devices. 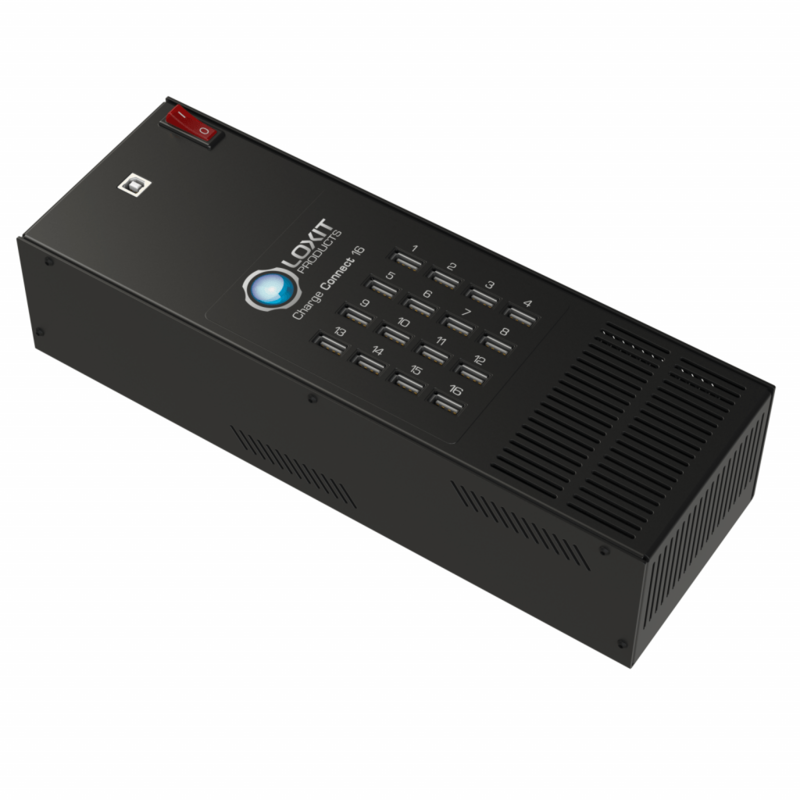 ChargeConnect 16 Universal is a professional quality sync/charge device via USB ports with in built energy saving and management technology. A professional grade universal USB charger which is able to output max 2.1A per port continuously. 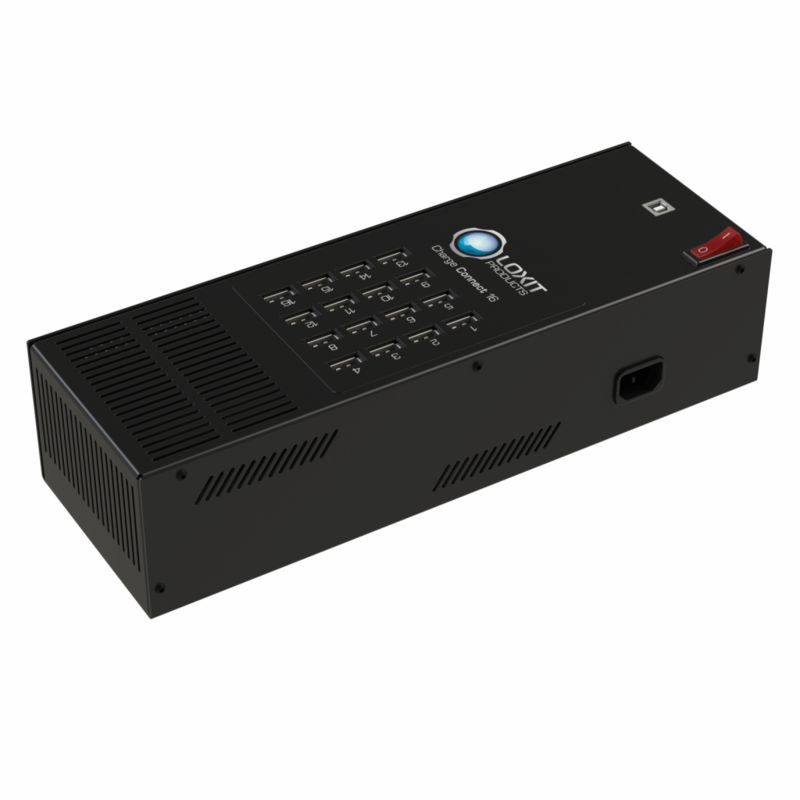 When a device is plugged into any one of the 16 ports, the processor profiles the device and ascertains the correct amount of charge to deliver to the individual device. This means that you are able to mix and match devices from different manufacturers and charge all at the same time. This could include tablets, mobile phones, e-readers, 3-D glasses, GPS devices, cameras etc, anything that is able to be charged by USB. To sync the devices, connect the USB A to B cable provided, from the ChargeConnect 16 with Intelligent Charge using the single USB B port, then connect the USB A end to the host computer. The host computer is then able to “see” all devices connected and the user is able to manage via the manufacturer’s software. Sync & charge up to 16 devices simultaneously. Highly portable desktop universal USB charger up to 2.1A per port. Savings. Saves time managing devices. Saves money through speeding up tasks. Saves the environment through power savings and extended battery life. Universal. 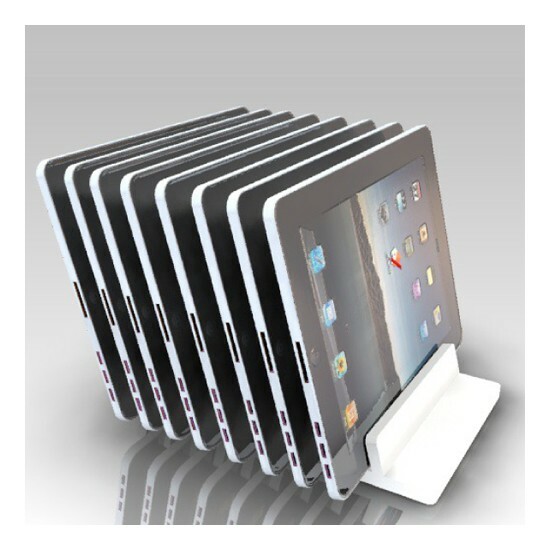 Pick & mix devices for ultimate flexibility. All iPads, iPad mini, iTouch, iPhones, iPods, Surface, Galaxy Tab, Toughpad, Nexus, Android Tablets, Kindle, Nook, MP3, MP4, Smartphones, 3D Glasses, Digital Cameras etc. can be charged at the same time via USB. USB A to B cable to connect to host computer supplied. A Mac computer operating iTunes will sync up to 30 iPads or Apple products simultaneously. PC’s operating Windows software, iTunes will sync up to 7 Apple products simultaneously. To sync or manage all 16 devices simply plug the USB B end of the USB A to B cable provided into the ChargeConnect and the USB A end into your host computer. The ability for a device to synchronize depends on the manufacturer or third party support for this. If the tablet’s manufacturer or a third party has produced software allowing the devices to be synchronized in large numbers, then the ChargeConnect 16 will perform this. For example, Apple’s Configurator software allows up to 30 Apple devices to sync simultaneously when using a Mac computer. When using a Windows based PC, this is restricted to 7 simultaneously. 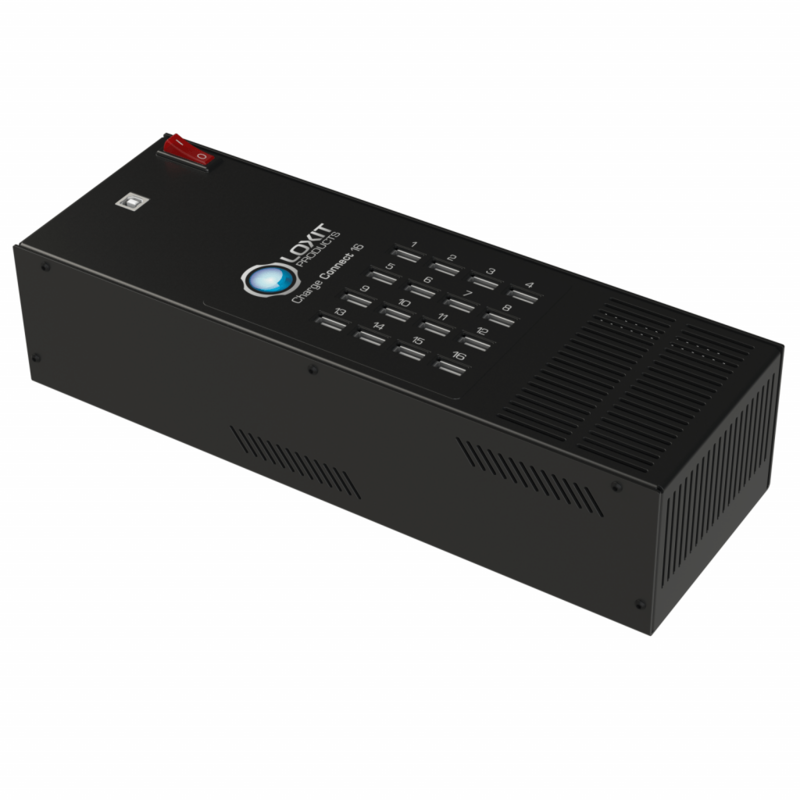 Therefore, dependent upon the manufacturer’s software, the ChargeConnect 16 can charge and sync up to 16 devices at once and provides a professional quality solution for the management of multiple devices. Mac computers can sync up to 30 iPads or Apple products simultaneously. For PC’s operating Windows software, iTunes will sync up to 7 iPads or Apple products simultaneously. 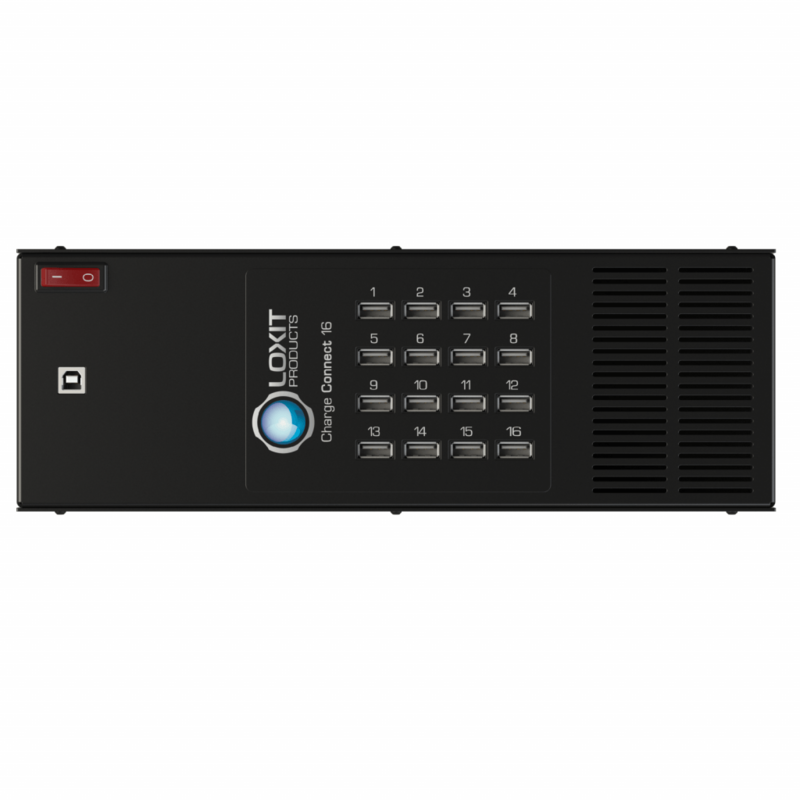 Ideal for use in education, health, training establishments, conferences, retail, rental and corporate environments. Used anywhere there is a need to connect to multiple USB devices to manage content and data or upload software. i.e. 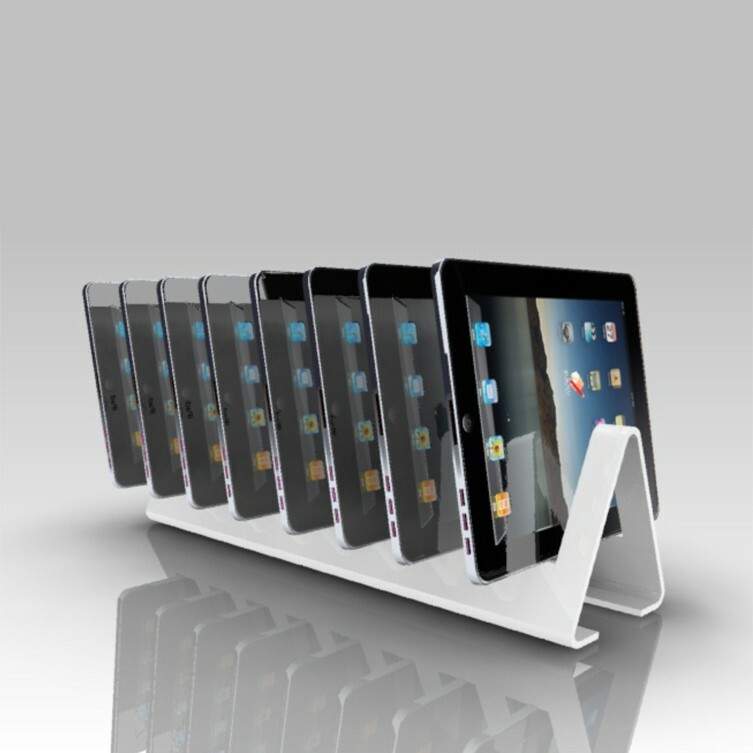 in a school or training establishment, retail environment or health sector for iPads using iTunes. The ChargeConnect 16 is perfect. Sync via a USB cable for 16 devices simultaneously is the fastest method of completing the syncing as well as ensuring wireless bandwidth on a network are unaffected.